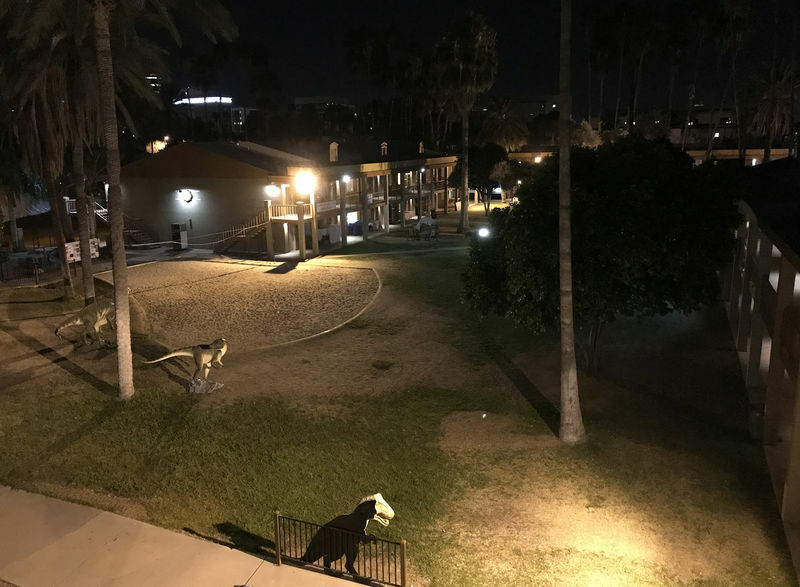 Posted: Jan 07, 2018 08:21 Post subject: Tucson Show 2018 - The FMF party in Tucson 2018 will have to be canceled! 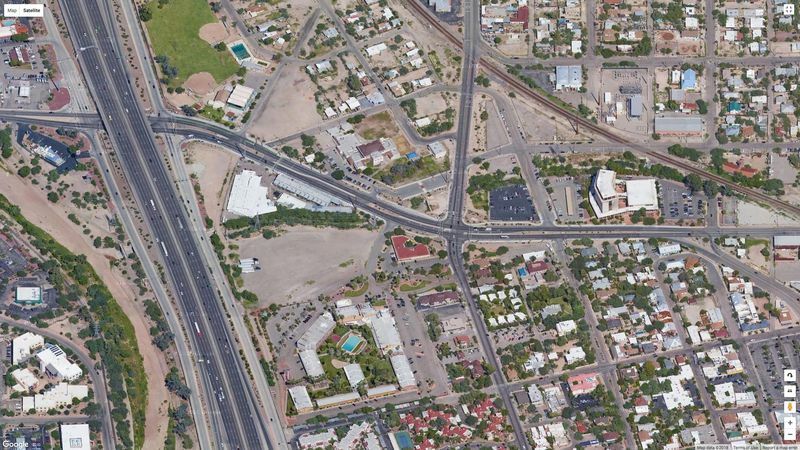 If we meet in Tucson we can talk about it and in any case you will find all kinds of information about the Tucson Show 2018 in this thread. 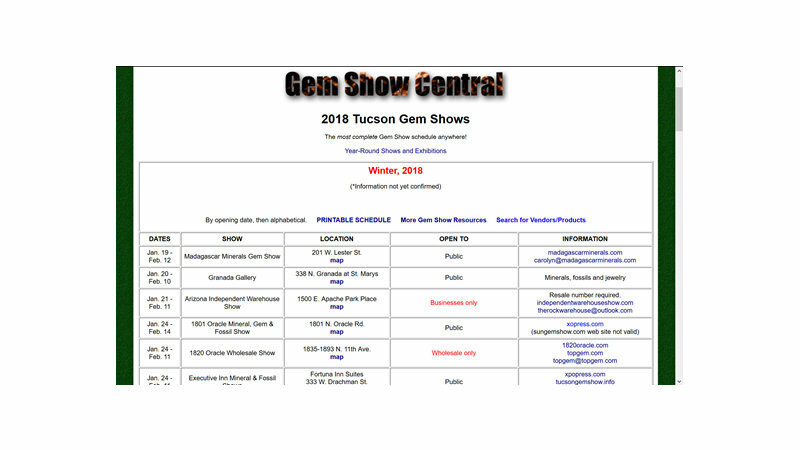 That made me think two things, the atomization of the Tucson Shows seems to have no end (51 Shows referred to minerals this year) and that makes it impossible to see them all even being there for three weeks. 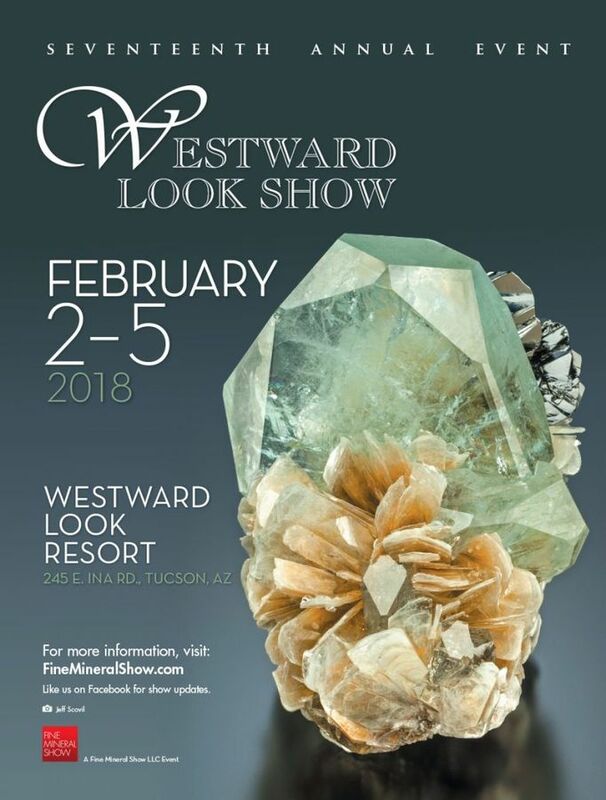 My second consideration has been: "I need a useful guide for to be able to know what all those shows are, where they are, when they start and when they ends..."
Fortunately the always efficient Xpo Press has a very complete online guide: 2018 Tucson Gem Shows which as its motto says is "The most complete Gem Show schedule anywhere!" Great job, they even warn about that web page for sale! 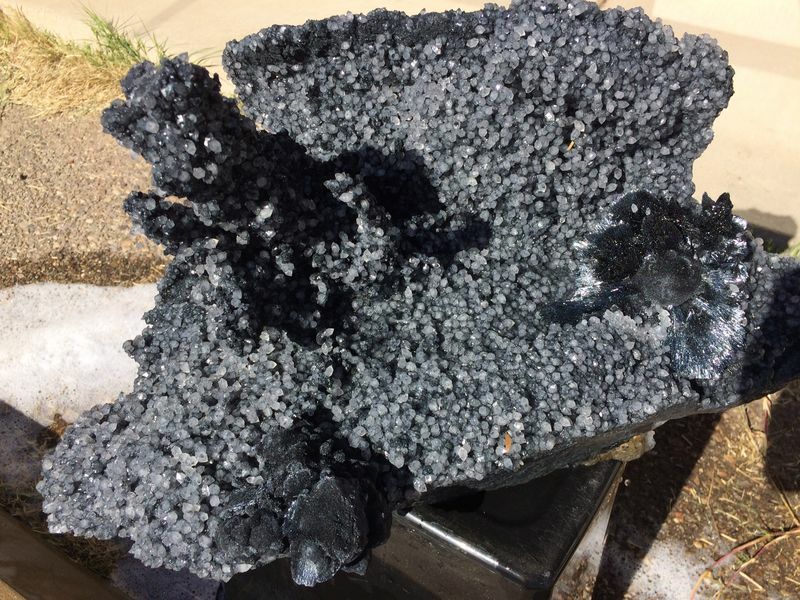 Obviously all this has brought me back to the interesting topic of The overall health of this hobby and it has made me think that maybe so much dispersion could be one of the reasons for the discouragement expressed by several FMFers in relation to their attendance to the Shows of Minerals. You will see a list of all the dealers in alphabetical order with location. 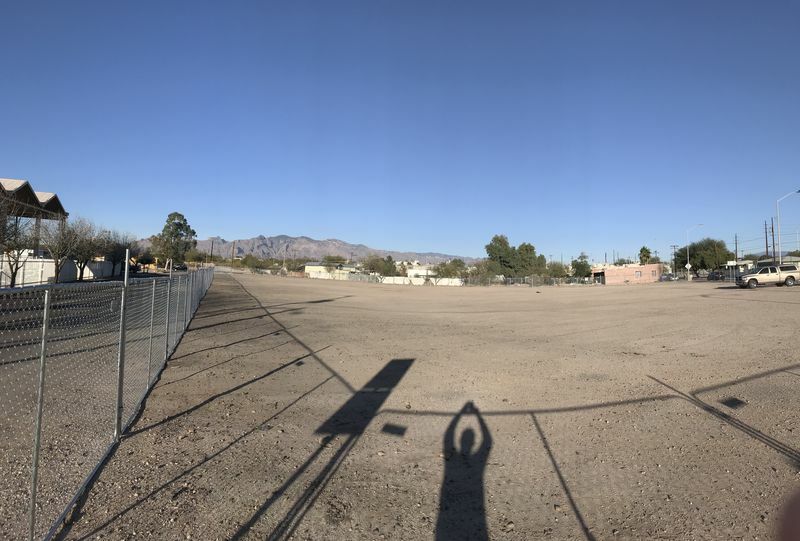 From what I have read and heard about Tucson 2018 is that one large venue may have parking problems and another plumbing problems and another structural problems, the latter not being a mineral venue. For me the show starts when Adam Wright and Erika Aheimer arrive in Tucson to open the most recent shipping containers of Crocoite from the Adelaide Mine. This past collecting season was average at best for the team but there was one notable hit - a small vug that Adam says produced the best quality crystals since the most recent mining adventure started. 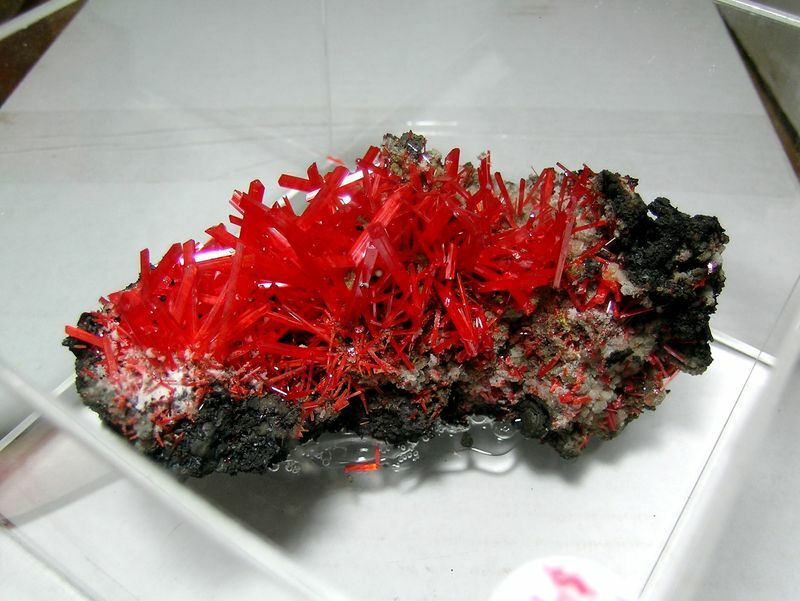 The vug was (regrettably) small but the crystals were vivid red, gemmy, very lustrous with clear lustrous chisel terminations. A few photos are attached for your viewing pleasure. Only about a dozen specimens are available. 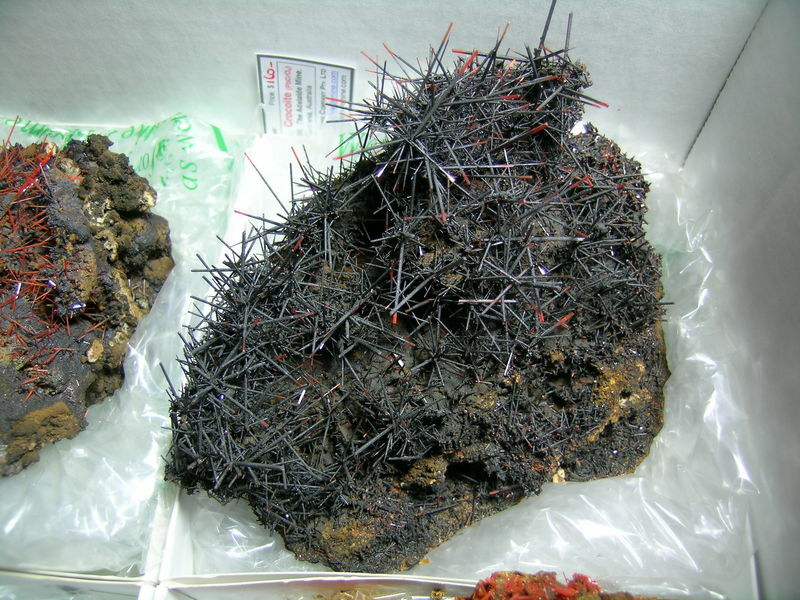 A few years ago Adam encountered what he called the Black Forest pocket which were crocoite xls fully/partially altered to manganese oxides. 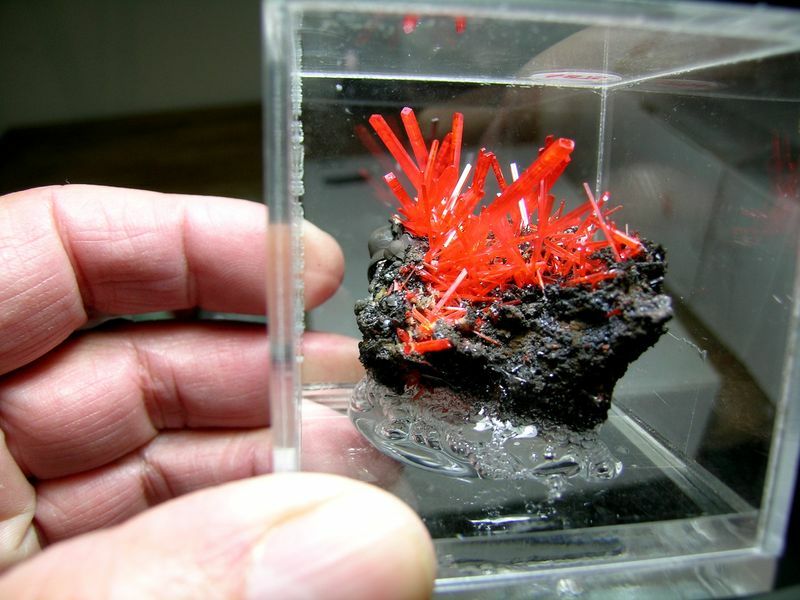 The delicacy of the pieces though didn't allow them to survive shipping and they all went mineral heaven. 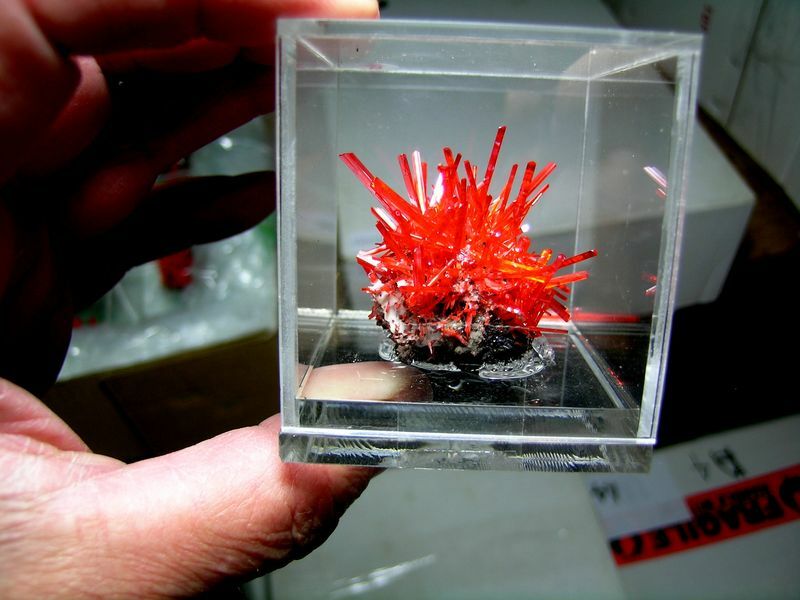 This year's shipment had a few pieces that Adam stabilized at the mine and they arrived fully intact. Not the most attractive specimens but totally unique pieces. One more week till the real action starts. 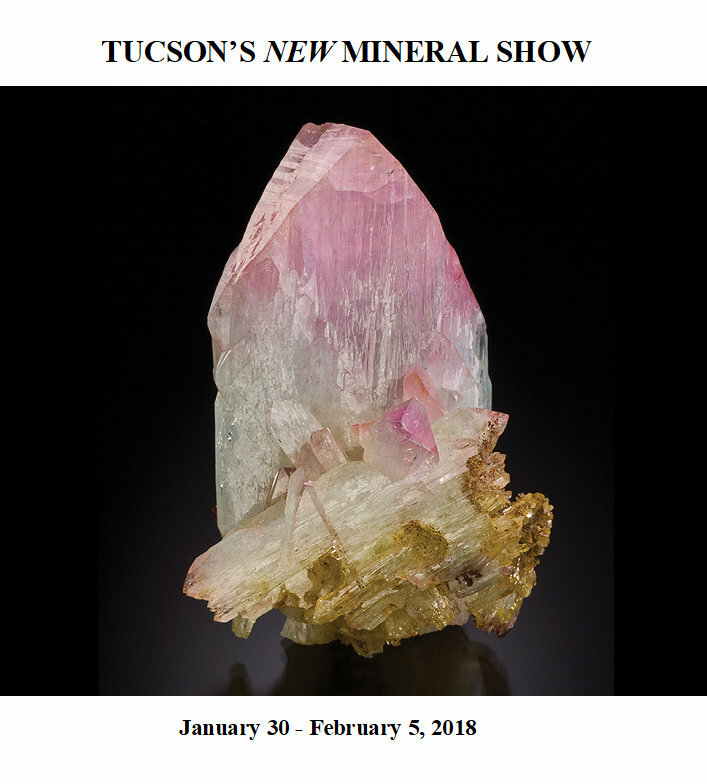 Note that Tucson's New Mineral Show had to move it's location. Instead of the old movie complex south of Grant it is now in a facility NORTH of Grant pretty much across the street from the old venue. Like many of you, I received a post card in the mail advertising the 2018 WL show. The material behind the beryl on the upper right looks so metallic that i wondered if this could be a rare association with beryl. I puzzled over it for a minute or so before i realized that the metallic look is probably just a trick of lighting making something, probably mica, look metallic. Am I the only one who spent any time puzzling over this? What do people think (or know in the case of those who know the specimen) the metallic-looking material is? 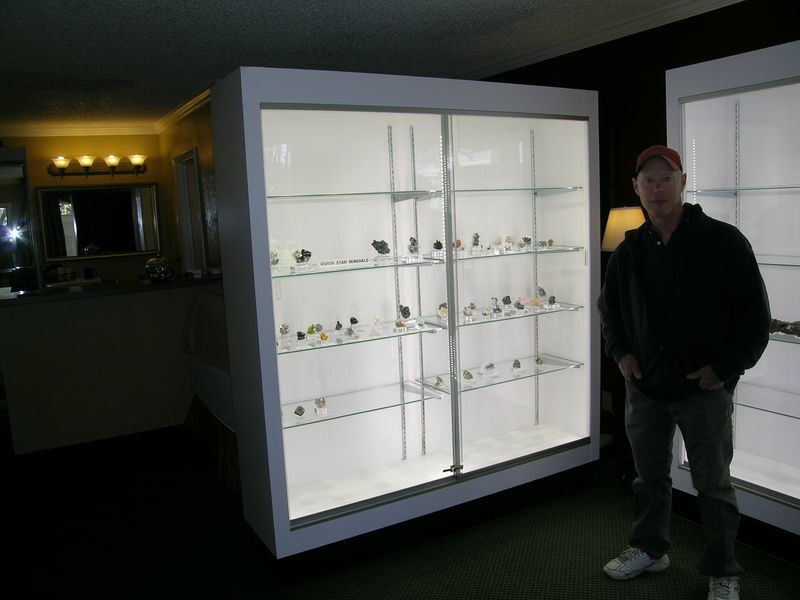 I don't know what that mineral is, Matt; like you say, the metallic luster might just be an artifact of the lighting. But I would like to point out that truly metallic minerals can occasionally appear in pegmatites. I have a lovely thumbnail "star" of twinned arsenopyrite that came out of a microcline and smoky quartz pocket in a pegmatite in Japan. Like many of you, I received a post card in the mail advertising the 2018 WL show. The material behind the beryl on the upper right looks so metallic that i wondered if this could be a rare association with beryl. I puzzled over it for a minute or so before i realized that the metallic look is probably just a trick of lighting making something, probably mica, look metallic. Am I the only one who spent any time puzzling over this? What do people think (or know in the case of those who know the specimen) the metallic-looking material is? Years ago, near Madrid, I found a pocket of loose arsenopyrite crystals (they had been with with laumontite, I suspect) in the La Cabrera pegmatites. They are ugly but unusual. As Tobi says well the metallic mineral at the right side upper the Beryl of the image is Cassiterite. Posted: Jan 17, 2018 16:41 Post subject: It's back!! You can't keep a good name down. 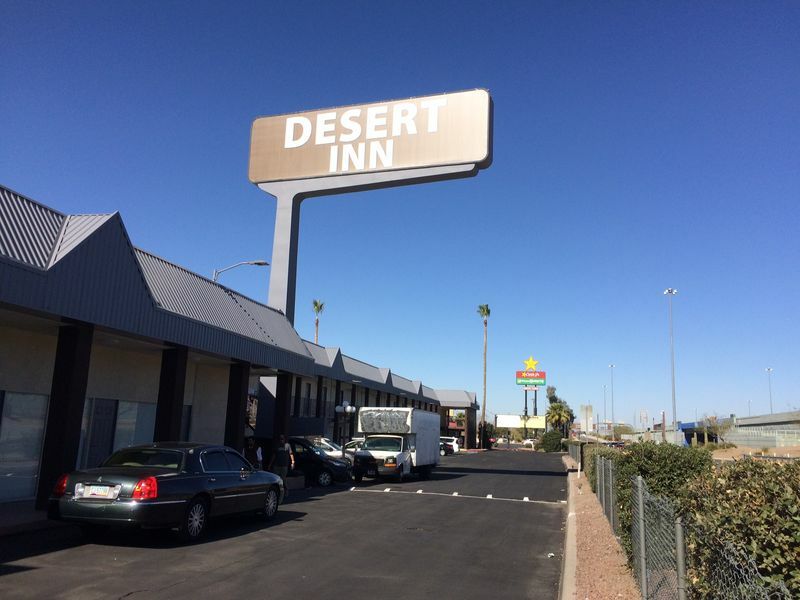 The Desert Inn days are back. What used to be the Day's Inn is now the Desert Inn. 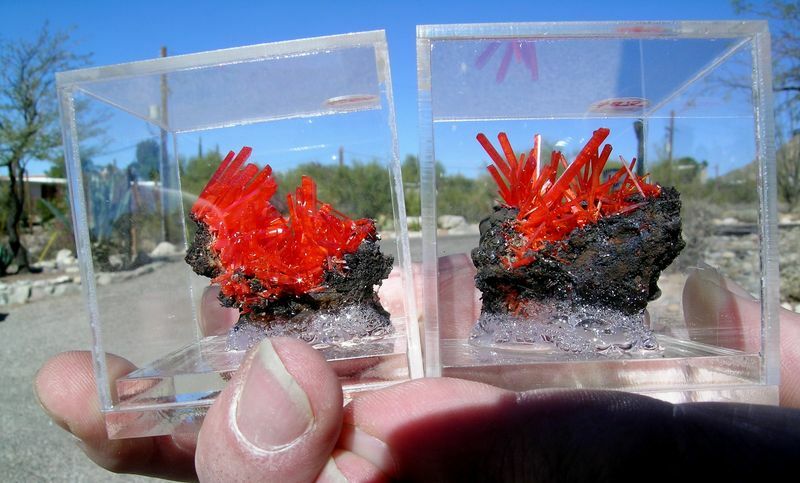 I was down at the Tucson Showplace today and ran into Luis Burillo and Jose as they were preparing some specimens for the show. Luis dug out a few oldies - one from about 15-20 years ago from Herja - stibnite flowers with boulangerite on quartz "diamonds" (little double terminated quartzes). 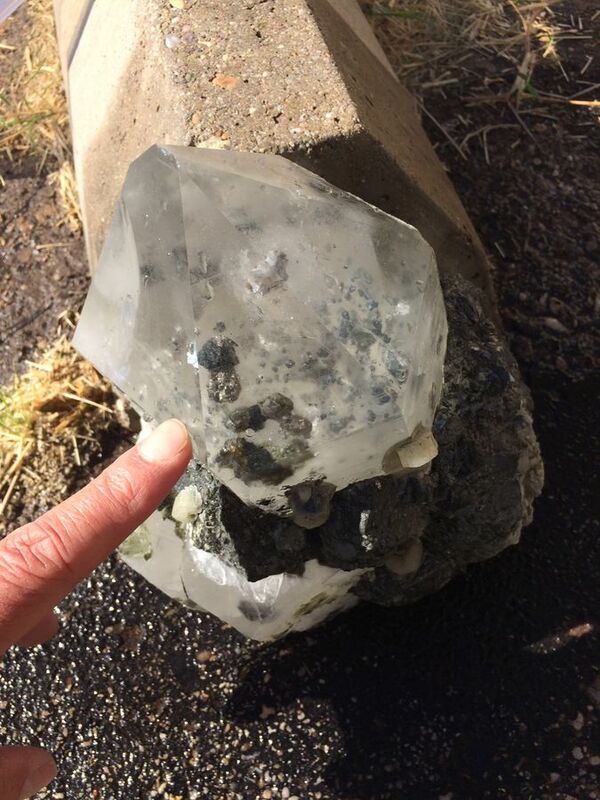 The other from Panasqueira - a huge quartz point with "everything" included. "Everything" that Panasqueira produced anyway - arsenopyrite, apatite, and who knows what else. Nice to see that there's still some old dusty stuff still around the warehouses of Tucson. 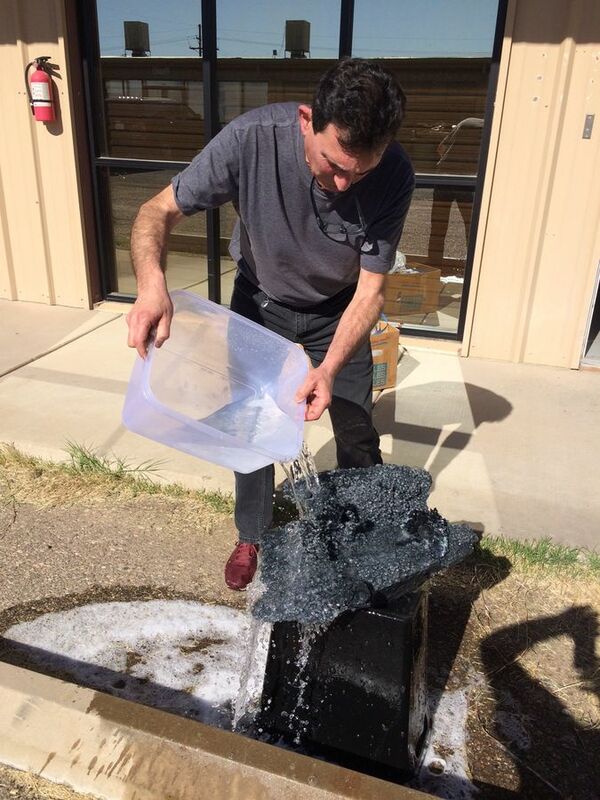 Luis Burillo washing a Herja specimen. 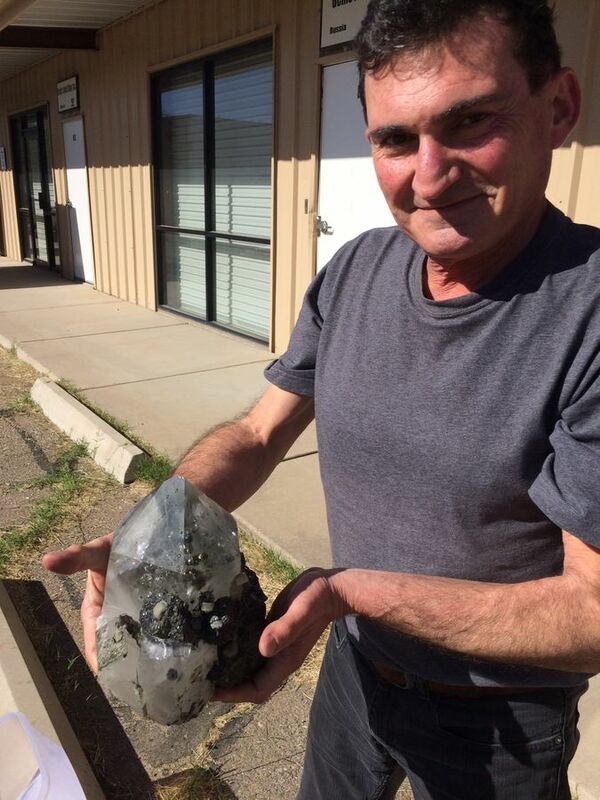 Luis holding a freshly washed quartz point from Panasqueira. Note the many inclusions. Luis says "everything" from Panasqueira is included. I notice that they are interesting specimens, but the down side is that, according to your posting, they seem to have been sitting, gathering dust and costing the warehouse fees for 15 - 20 years. The bottom line is that they haven't sold. I suggest you put the specimens and their owner out of unsold misery and buy them at this year's show! 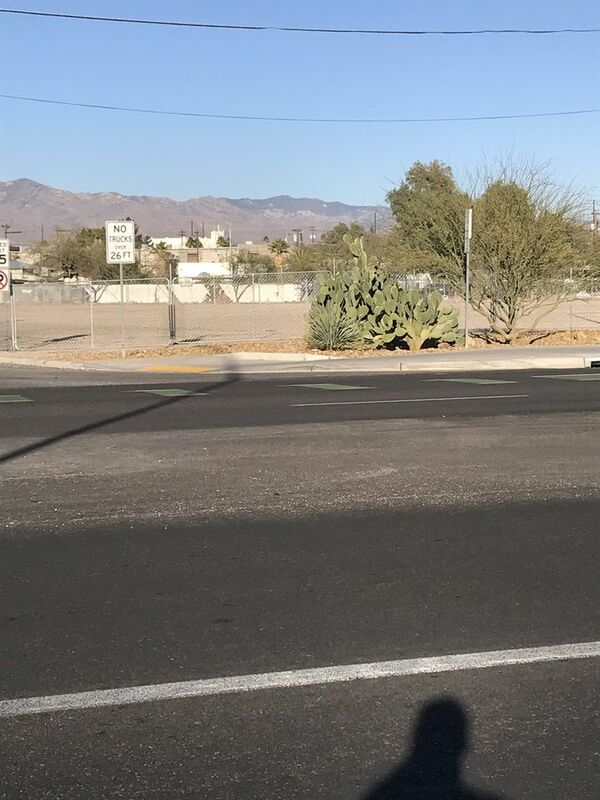 Just arrived to the terrorific Tucson I have been able to verify that in what refers to the HTCC-InnSuites Hotel there is no reason for the terror. The organizers have hired a free parking lot for visitors, really huge, and only 5-10 minutes walking to the Hotel. That and the large parking of the same Hotel I think will make everything similar to the previous years, if not better. Tomorrow I will publish pictures of this new parking lot and better maps, for today here you have the photo of the small printed map offered in the lobby to the visitors by the team of the Fair. About the Show itself, it seems that about a 1/3 of the dealers are already displaying which, as discussed before, makes the scenario very complex for the small dealers, specially considering that a large dealer, Crystals Classics, was today already in full activity at their different rooms in the HTCC-InnSuites. 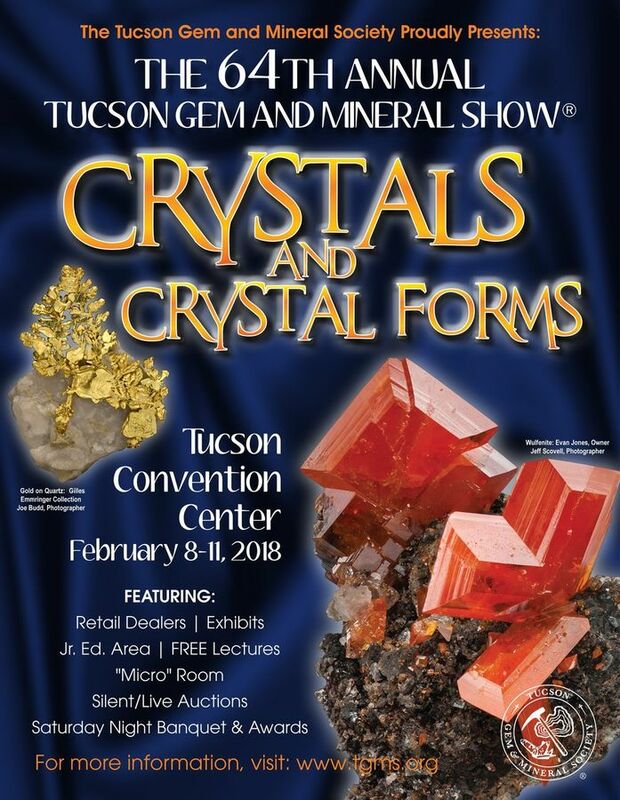 One of the major events to open the Tucson Show is the opening of Top Gem Minerals - this year was as good if not better that the past openings. Mike and Jason New had numerous tables of high quality Vera Cruz amethyst and many more tables of Milpillas azurites and pseudomorphs. 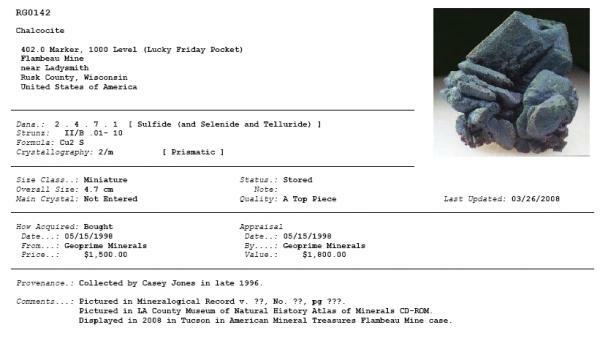 When it comes to Mexican minerals, it's hard to beat Top Gem. Lots of other material spread out around their warehouse. After the initial mineral feeding frenzy which lasted till noon - the food feeding frenzy followed with the usual Mexican lunch with Mariachi band providing the entertainment. The perfect sunny day caused us patrons to clean out the beer cooler. The food feeding frenzy was more civilized than the mineral frenzy. 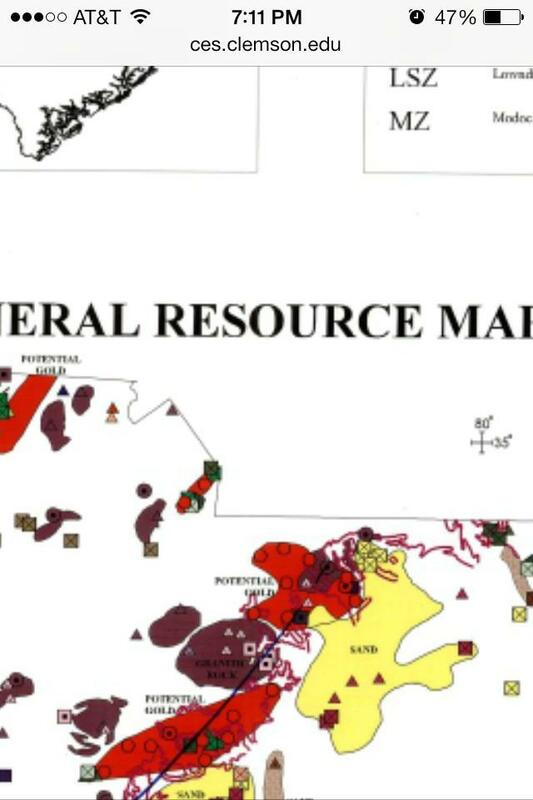 Jason supervised the Milpillas tables and said that this may be the end as the mine has proceeded past the oxide zone and is in the sulfides. I think I heard that 3 years ago also. the two lots specified by Jordi are (depending on who you believe) reserved for dealers. a few dealers told me about the vehicle tagging details - starting Saturday, dealer cars/trucks/vans parked around the HTCC must be removed to these lots first thing in the morning and they must have a tag (provided by the motel organization) to park in the lots. a few heard that these are also to be used by the public and went ballistic. this Saturday will be the true test of how thing work out. it should be interesting! get there early and hope for the best. So, is life not a quest to use our inherent abilities and enthusiasm to reach our goals in style and grace, so as to enhance our miserable existence? Let us endeavor to overcome the imagined, prejudicial and real obstacles to our enjoyment, and chill. 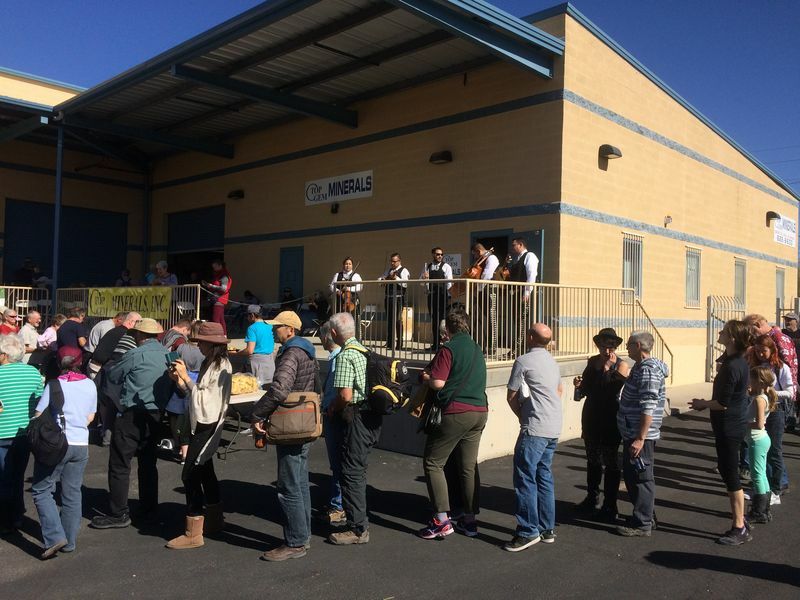 I understand what’s at stake for dealers and collectors, and the only reason for my participation in this endeavor is to make it happen as best as I can, and my enthusiasm will not be dampened by a parking inconvenience and a change of what may be my comfort level around a mineral show. Come and enjoy what we have, or don’t. Good luck, bad luck, all the same. Life is change, so try to have fun and be of good cheer. Welcome to Tucson. 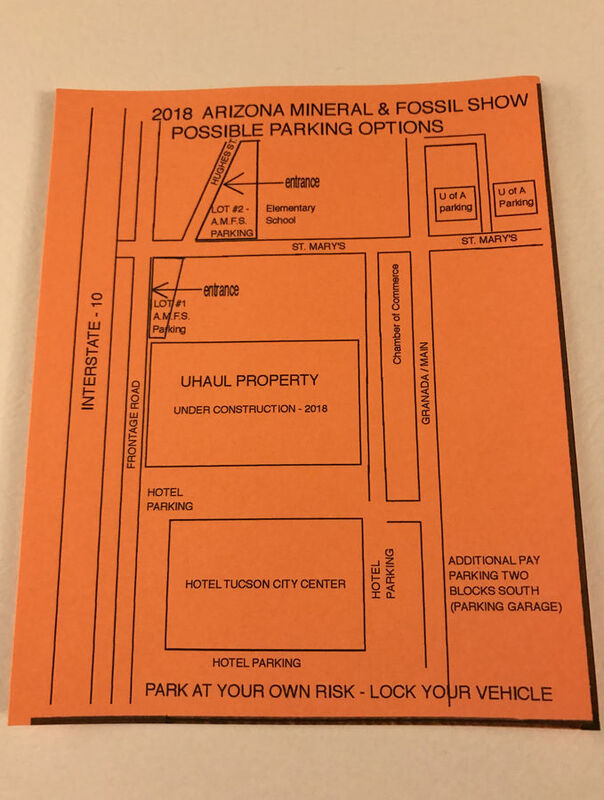 It’s free parking, not unlimited parking, show me where unlimited parking exists and let’s have a mineral show there. It will be the best.Thanks for you tolerance and patience. 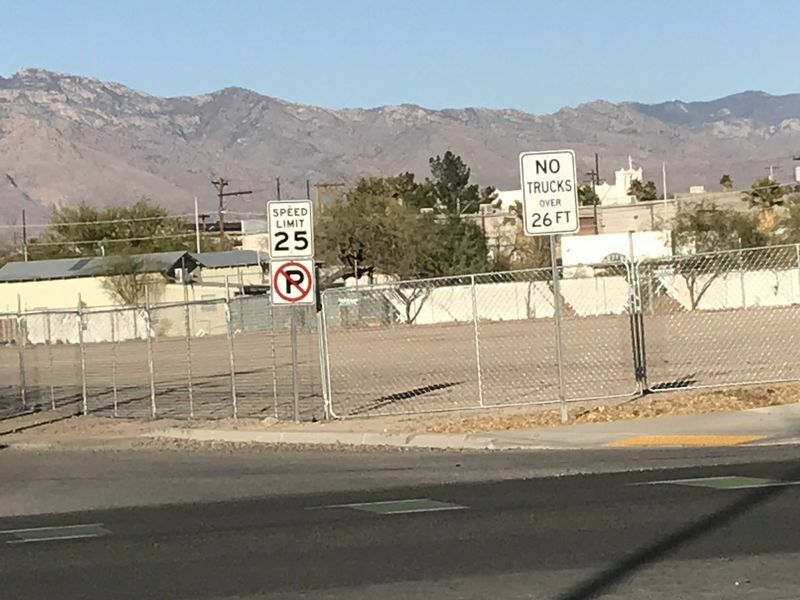 As was mentioned, dealer parking has and will be a primary focus in the satellite lots, but the mixing of dealer and customer parking in the past has been demarcated by caution tape so if there is a complaint of the mixing or co-use of the lots, it seems a bit picayune. Dealers have already figured out how to beat the “honor system” and our attempts at regulation around no dealers parking on the grounds during the show, so tell me the solution to that. Then a complaint about lack of parking may be taken seriously. I stuck my nose into Ross Lillie's room today to say hello and see what he had to offer. His room was practically totally devoid of specimens. I thought that maybe a shipment hadn't come in yet so I asked jokingly if he had sold out already and he matter of factly said YES! He was serious - he had indeed sold essentially everything he brought - three days before the show officially starts!!! He further mentioned that this will be the last commercial show he will attend - after 35 years of mineral collecting and dealing. 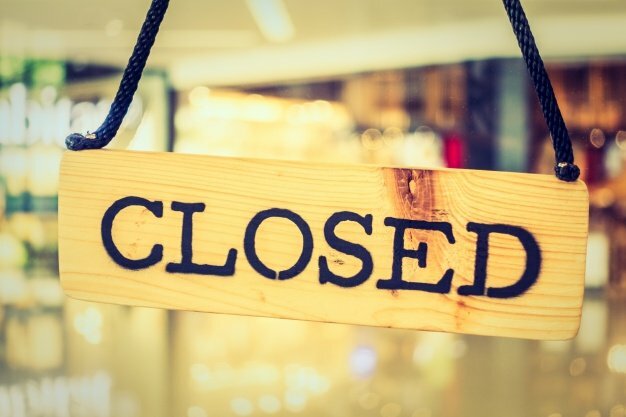 It's a true end of an era - congrats to Ross. Ross Lillie and his empty room - three days before the show starts. This is to be his last commercial show.